Water Infiltration. 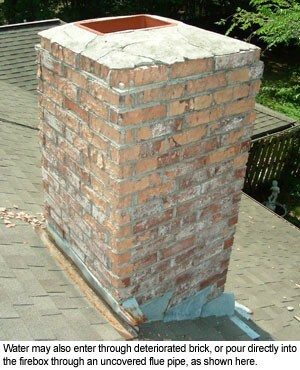 Water entering a chimney can cause several problems, and should be prevented with a quality chimney cap. (see below) and crown. Water entering the flue mixes with creosote and is acidic, often causing premature rusting of the damper, and also contributing to deterioration of the brick and mortar. Water may also enter through any cracks in the chimney crown, the chimney shell itself, or through faulty flashing where the chimney meets the roof. Any such leaks can be quite frustrating to diagnose, and can also cause water damage to ceiling and flooring materials adjacent to the interior fireplace. Improper Dimensions. The proper building of a full masonry fireplace is sadly becoming a dying art—especially in the southern states, where fireplaces are used less and prefabricated metal fireboxes are taking their place. Very few residential masonry contractors are qualified to build a safe and efficient fireplace from the ground up these days, and many that were built since the 1970s have significant problems. Two common design flaws include chimneys that are too short to prevent downdrafts, and areas between the lintel and throat that are not tall enough to allow smoke to “roll” before entering the smoke shelf. Both of these can cause a fireplace to draw poorly—letting smoke into your living area. Besides lightning damage, which surprisingly occurs quite often, chimneys are also susceptible to other common deterioration problems. Partially because of their exposure to the harsh weather elements, repairs to chimneys are among the most common needs when it comes to brick repairs. Deterioration. Both brick and mortar can be subject to deteriorate over time. While most bricks are hard-fired and should last well over 100 years, many adobe or antique blends are softer and more porous, and may last only 50 years or less. “Spalling” occurs through freeze-thaw cycles, when rain soaks into the brick, then freezes and expands, separating thin layers of the brick from the face. These layers may eventually begin to fall off and be found at the base of the chimney or other exposed walls. Mortar joints can also deteriorate or develop voids prematurely, depending on the type used and the methods employed during original construction. Cracked Crowns. Simply as a matter of convenience, chimneys are most commonly finished off with a crown built with mortar, although this practice is clearly substandard. 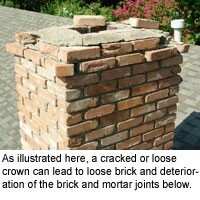 Mortar crowns shrink, crack, and deteriorate prematurely, allowing water to enter the top of the chimney. This then may cause brick to pop loose or deteriorate, and contribute to problems with other chimney components and adjoining construction materials. Chimney crowns should be poured with portland cement or concrete, rather than mortar, or be completely covered with a custom chimney cap. Flashing. Two types of flashing are typically installed to prevent rainwater from entering between the roof and chimney. Primary flashing is installed by roofers and is placed under the shingles. 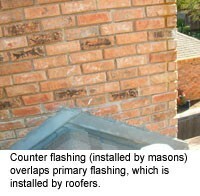 Counter flashing overlaps primary flashing, is cut into the brickwork, and is usually installed by masons. Even a minor breach in this flashing can cause a significant leak, as water pours into this crevasse during rainfall. To keep water from entering the flue and/or chimney shell. To keep birds, squirrels, and other animals out. To keep other debris out (such as leaves or nesting material) which could cause blockages. To help prevent fireplace odors caused by dampness and/or animals. To block sparks and any burning airborne debris from exiting the chimney. To help prevent or limit downdrafts in windy conditions. A basic chimney cap that mounts onto the flue liner can be purchased from a hardware store, We do not recommend these, There quality is sub-par at best. Our chimney caps are made of galvanized sheet metal, stainless steel, or copper can be a little more expensive but in most cases carry lifetime warranties, And are designed to protect the entire top of the chimney. CCM. custom caps fit like a glove because there are multiple measurements made for each one…and they’re securely installed with masonry anchors drilled into the chimney. These handsome caps provide the ultimate protection for both the crown and the flue. Or simply fill out the contact information form, And we can contact you at your convenience. This will help us to better serve you. All contact information is confidential and will not be released to third parties.